Update: Living Rich With Coupons now has a FREE Coupon Spreadsheet. It’s available in for Excel newer and older versions. I have received a bunch of emails today from readers wondering about the iPad Couponing App that was used on Extreme Couponing last night. Well, I did some digging and I found it. It is called the WMC Couponing Spreadsheet Template and it can work on the iPad or on Excel. If you want to use it on your iPad, you will need to have the Numbers App installed. The Numbers App costs $9.99. 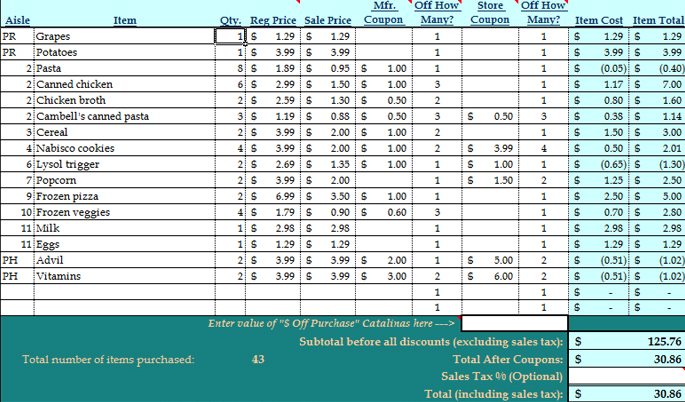 The cost is $4.99 for the WMC Couponing Spreadsheet Template in either the iPad format or the Excel format. As of right now, I do not have an opinion on it as I just downloaded it myself and I haven’t had time to go through it yet. There were enough of you that were inquiring about it today so I wanted to post the information I found. If you are handy with excel, you can probably do this yourself.